Although commercial steam locomotive development ended about 1950, at least one man realized that the steam locomotives built up to that time did not reflect the maximum that could be achieved with steam power. Ing. Livio Dante Porta was a colleague and student of Chapelon, who continued to advance steam locomotive design from the 1940's until his death in 2003. Ing. Porta's single best-known innovation is the Gas Producer Combustion System (GPCS). A relatively simple modification to any solid-fueled steamer, the GPCS nevertheless greatly improves boiler efficiency, eliminates spark throwing and smoke, and greatly reduces boiler maintenance. Other major innovations developed by Porta include the Kylpor and Lempor exhaust systems. These exhaust systems are backed up by detailed theories which explain their application and design based on proven thermodynamic principles. 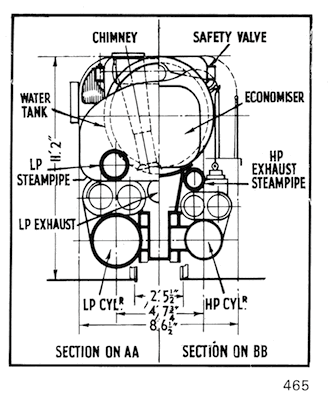 Porta continued and refined Chapelon's practice of applying rigorous engineering analysis to steam locomotive design- as opposed to the "trial and error" approach so often used by other steam designers. Born in 1922 in Argentina, Porta was involved with railway operations at an early age. 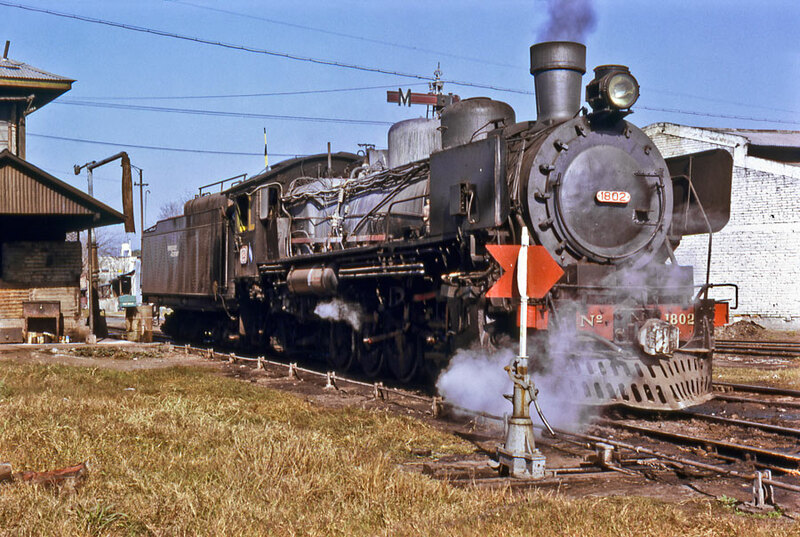 Soon after graduating from college, in 1948 Porta performed his first locomotive conversion on a meter gauge 4-6-2. He modified the locomotive to a fully streamlined 4-8-0 wheel arrangement (shown above), added compound cylinders, higher superheat, re-heat between the high pressure and low pressure cylinders, an early form of the GPCS, a Kylchap exhaust system and other advancements. Major components were fabricated using welded mild steel reducing fabrication difficulty compared to pouring large castings. While the engine was a great success, track conditions in Argentina were not really suited for it and it saw limited use. However, it clearly showed that Porta knew what he was doing and he was soon commissioned to perform modifications to other engines. His next project in the early 1950's was the modernization of a fleet of 2-6-2T's used in commuter service. With relatively minor modifications, he increased the output of these engines dramatically. These engines appear to be his first application of the Lempor (Lemaitre-Porta) exhaust system, one of his most important innovations. The function and design of the Lempor Ejector is described in Porta's paper Theory of the Lempor Ejector as Applied to Produce Draught in Steam Locomotives written in 1974. The excellent performance of this device was not due to any special configuration, but due to the theory which allowed the device to be designed to be optimally sized for a given locomotive. Porta later more-extensively modified one of these commuter engines, enabling it to outperform far larger 4-6-2's in passenger service. Unfortunately, the diesel was already making inroads in Argentina and no further locomotives were modernized. 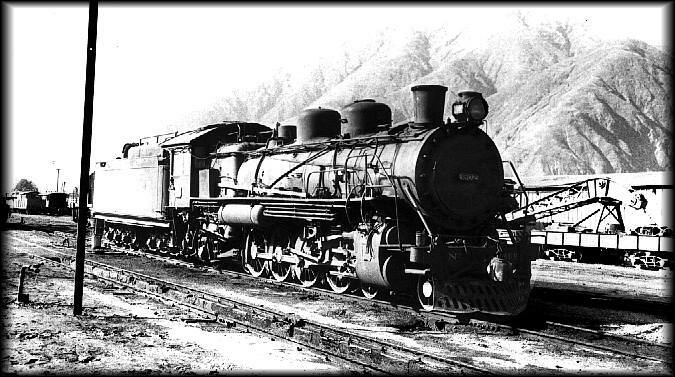 About this time (1957), Porta was given the opportunity to take over the coal-hauling Rio Turbio Railway as general manager. This proved to be a fertile ground for Porta's work. 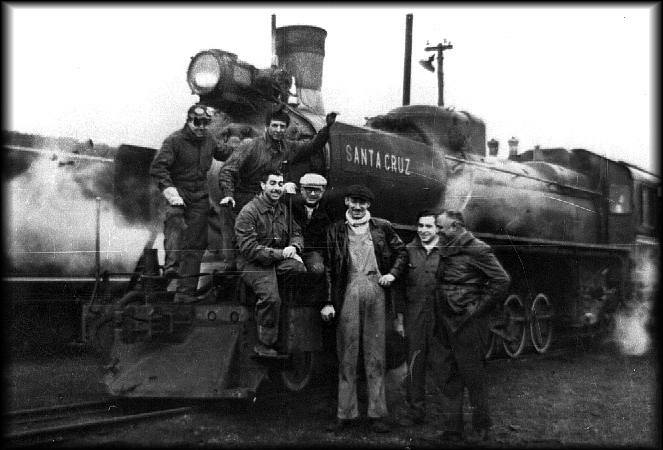 Porta and crew in front of 2-10-2 # 110 "Santa Cruz"
These 2' 5-1/2" gauge 2-10-2's were built in the 50's and 1960's by Mitsubishi Heavy Industries of Japan for service on the Rio Turbio Railway in Argentina, at the southern tip of South America. The first batch of engines, present when Porta arrived, proved highly capable and quickly displaced older 2-8-2's. However, Porta soon set about the systematic modification of these engines to improve their efficiency, power, and availability. So successful were these modifications that when additional engines were ordered in the 1960's, these refinements and others were incorporated in their construction. As a result of these developments, the Rio Turbio 2-10-2's were one of the most efficient groups of steam locomotives ever operated. Tests document that the engines routinely achieved 12% efficiency, nearly equaling Chapelon's famed 4-8-0's, and could attain up to 15% efficiency under controlled conditions. Furthermore, their routine day-to-day efficiency, including idle time, was much higher than that attained by previous engines. These engines feature gas producer fireboxes, Kylpor exhaust systems, and massive 6-axle tenders which contain mostly coal. Auxiliary tenders provide ample water capacity for extended runs. Aside from the major modifications to these engines, Porta developed numerous detail design improvements on these engines. 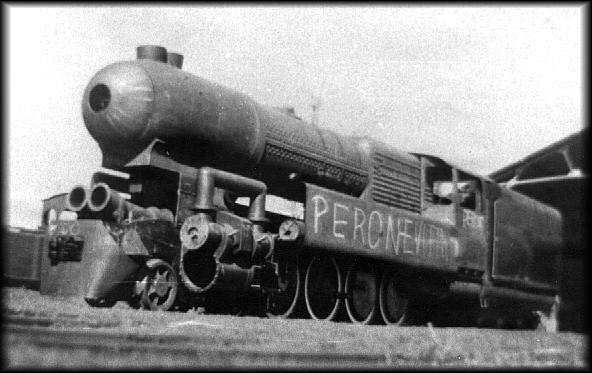 4-6-2 #4674 was a project to show that the plentiful low-grade coal from the mines at Rio Turbio could be used in coal burning locomotives for all of Argentina. This engine was originally designed and built to burn imported high-BTU Welsh coal (similar in characteristics to U.S. Pocahontas coal). Using his Gas Producer Combustion System, Porta successfully converted the engine to operate on Rio Turbio coal (very similar to the low-grade coal burned in the Union Pacific's locomotives), while maintaining the same performance it had achieved with the original fuel. Porta achieved his successes through careful attention to small details and by the application of strict engineering principles to steam locomotive design. No single change could produce dramatic improvements; Porta applied many small improvements to areas that had been ignored before. These included items such as water treatment, lubrication, materials, servicing techniques, mechanical fasteners, and others. Not only was power and effiency greatly increased, but maintenance was greatly reduced and the operator's jobs were made easier. After a few years at the Rio Turbio, Porta moved back to Buenos Aires to join the Instituto Nacional de Tecnologica Industrial (INTI) where he became the head of the thermodynamics department. At INTI, Porta was able to devote time to thinking about the next generation of steam locomotives. In 1969, the railways in Argentina seemed to suffer an epedemic of water quality problems, and they asked for Porta's assistance. 4-8-2 No. 1802 of the Belgrano Railway was chosen as a test engine, and Porta developed an on-board water treatment system based on the French TIA system. The water treatment system was so successful that it was eventually possible to operate the engine with boiler wash-outs only twice in a full year. The engine was also modified by Porta with multiple improvements, including improved exhaust, improved valve events, and a high adhesion tire profile. at LaQuiaca Line in 1971. In 1969, Porta presented a detailed technical paper titled Steam Locomotive Development in Argentina - Its Contribution to the Future of Railway Technology in the Under-Developed Countries to the Institution of Locomotive Engineers in Great Britain. This paper discussed Porta's work on the Rio Turbio 2-10-2's, and provided detailed results of performance tests of the engines and their maintenance history. Porta also outlined his concepts for new, technologically advanced steam locomotives which would be suitable for use in non-industrialized countries. Already by this time, diesel-electric locomotives in less-advanced countries had begun to show faults. Whereas steam locomotives could be routinely abused and maintained to a large degree (where necessary) with sledge-hammers and bailing wire, diesel locomotives required precision maintenance and repair. Expensive repair parts had to be imported to cash-strapped third-world countries to keep diesels running, while before most steam repair parts could be fabricated locally. In some cases relatively new diesels were sitting idle while ancient steamers had to be pulled out and put back into service. Porta saw that there were many cases where steam power was economically justifiable and presented his case for new engines to accompish this. Porta's paper provides a wealth of information on steam developments in Argentina, both by Porta and other engineers, and provides insight which is still valid today. Porta proposed several new designs for steam locomotives for various railway inquiries in the 1960's and 1970's, incorporating his principals for greatly increased efficiency, reliability, and power. One proposal was a roller bearing, 3 cylinder compound meter gauge 2-10-0 for Argentina. Before anyone had heard of ACE, Porta had laid out a ultra-high pressure (850 PSIG), 3 cylinder, triple expansion compound 2-10-0 for U.S. fast freight service. 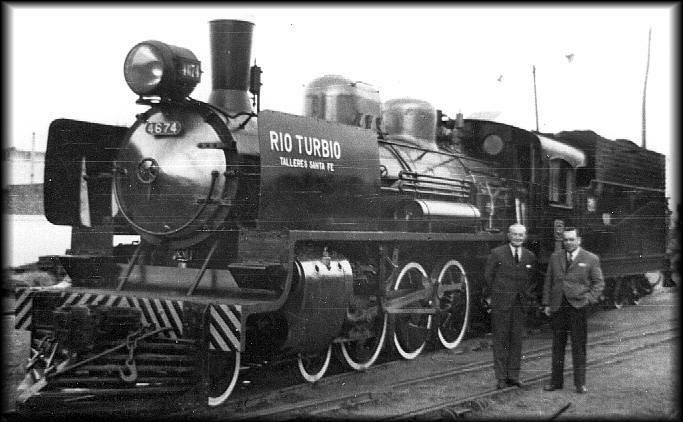 Bigger engines were considered for the Rio Turbio to provide power to move much longer coal trains. Initially, 2-10-10-2 mallets were proposed, but as the design was fine-tuned it evolved into the monster shown above. 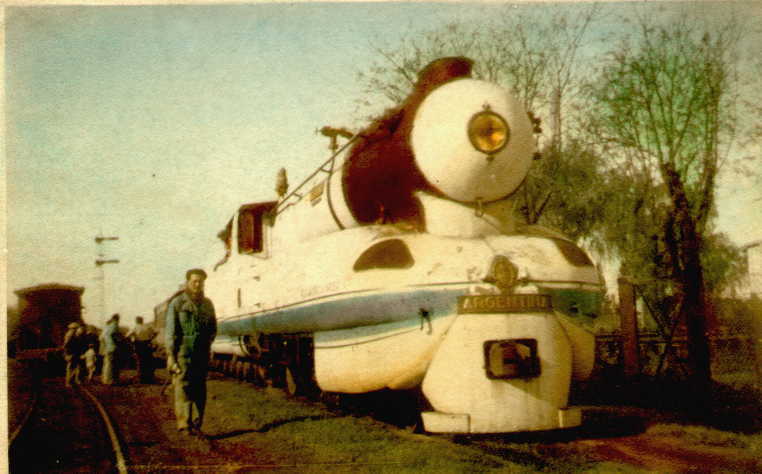 These massive 2-12-12-0's were proposed as replacements for the 2-10-2's in the 1970's to allow far heavier trains to be operated, and a contract to construct them in Argentinian shipyards was almost let. Unfortunately, changed circumstances killed the project. Other arrangements were proposed for new locomotives even including a massive Mallet-Garratt, but none of these ever came to fruition. 1- First Generation Steam (FGS)- Steam locomotives which had been previously built. He viewed the French designs as being the climax thermodynamically, while he considered American engines the best mechanically. No engines in existence had ever incorporated all of the proven concepts of FGS. 2- Second Generation Steam (SGS)- Steam locomotives which could be built immediately with little or no research and development, which would incorporate and maximize all proven thermodynamic principals for improved performance, plus state-of-the-art materials, design methods, and construction techniques. 3- Third Generation Steam (TGS)- Steam locomotives which would incorporate advanced concepts which would require significant research and development, best acquired through trials on SGS locomotives. Porta felt that many existing steam locomotives could be significantly improved with the limits of FGS. He also believed that SGS locomotives could successfully compete on modern railroads, if they were given modern servicing facilities (as developed in the U.S. by the Norfolk & Western Railway) and if proper maintenance and operating techniques were used, which were equally important to good design. In 1980, Porta was called in by American Coal Enterprises as the foremost authority on steam locomotive development. See the ACE page for information. Other steam projects in the 1980's were performed by Porta. The railways of Paraguay, which operate a fleet of wood-burning locomotives, called him in to assist in modernizing their railways. At least one engine was modified with a GPCS adapted for wood and other improvements. Later, Porta moved on to Brazil to the famous Donna Teresa Christina coal-hauling railway. This railway was famous for its fleet of U.S. built meter gauge 2-10-4's. 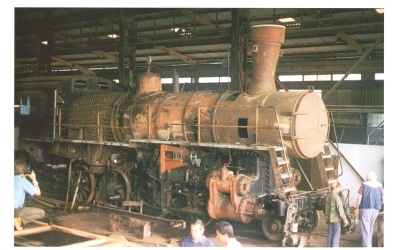 By the early 1980's, the 2-10-4's had worn out beyond the ability of the railways to rebuild them, and European built 2-10-2's were imported from other parts of South America. Porta was called in to see if the smoke emissions of the line's locomotives could be reduced. Naturally, the GPCS was just the answer to this, and one 2-8-2 and several of the 2-10-2's were so modified. Unfortunately, demand for coal from the mines has evidently declined in recent years and no further locomotives were modernized. Read more about these locomotives here. No. 1816 after completion on display at "Ecovapor 1999"
The island nation of Cuba still has many steam locomotives in service at present. Most are products of the United States dating from the 1900's through the 1930's and the locomotive shown above is one of them. Despite its age, 2-8-0 No. 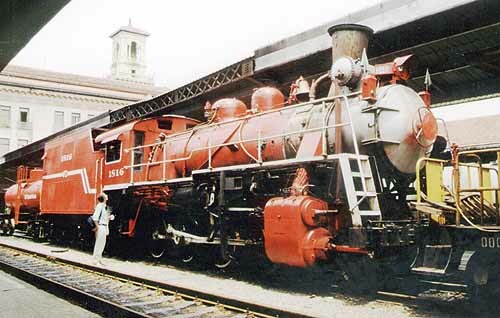 1816 is the most advanced steam locomotive operating in Cuba. A product of the United States' American Locomotive Works in 1919, she was heavily rebuilt under the supervision of Ing. L. D. Porta. Modified with higher boiler pressure, increased superheat, an advanced drafting system, a feedwater heater, supplemental air compressors, and other detail modifications, it was hoped this locomotive would be the prototype for a steam revival in Cuba. Initially equipped for oil firing, the engine is to later be modified with the GPCS to allow efficient combustion of "biomass", such as baggasse, the left-over crushed sugar cane husks resulting from sugar production in Cuba. Other possibilities for biomass fuel include wood, fast-growing varieties of which could be grown specifically for locomotive fuel. This would the use of locally produced fuel, as opposed to oil which has to be imported. No. 1816 was operated successfully (with the exception of a few "teething" problems) at a variety of locations in Cuba since its construction. Porta inspected the engine in June 2001 and found it in good condition after two years of service. As of 2002, work was scheduled to begin to convert the engine to the GPCS for the combustion of biomass, which was to be carried out at the mill where the locomotive was based. 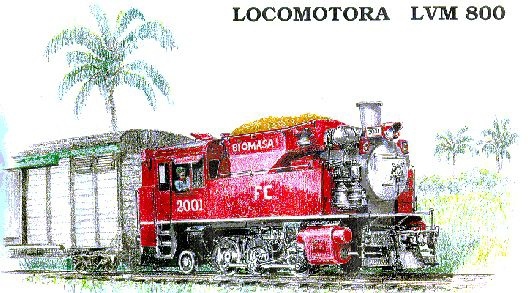 The most exciting news from Cuba was that new steamers, the LVM 800 class 0-6-2T, shown in an artist's concept above, was designed by Porta and a team of assistants consisting of engineers, technicians, and draftsmen. Production details were to be worked out with two Cuban corporations and production of the prototype was scheduled to begin in January 2002. There was even interest in Cuba in building larger new steamers. Unfortunately, the chief proponent of the project within Cuba died in 2002, and in 2003, the sugar industry in Cuba took a dramatic downturn. While it now appears doubtful that the engines will be built, there are still some efforts to continue this project. In 2002 and 2003, Porta worked with other new steam projects including a 2-8-2T for the "Railway to the Clouds" at Salta, Argentina and a small narrow gauge 0-4-0T or 0-4-2T for tourist railway service, among others. Porta also regularly assisted Shaun McMahon with his work improving locomotives on the FCAF in Ushuaia, Argentina. In early 2003, Porta was reported to be working on steam-powered buses for service in Buenos Aires. On Tuesday, June 10, 2003, Ing. Porta passed away, leaving many promising projects unfulfilled. Hopefully, the next generation of steam designers will succeed in fulfilling Porta's dream of building a truly modern steam locomotive.